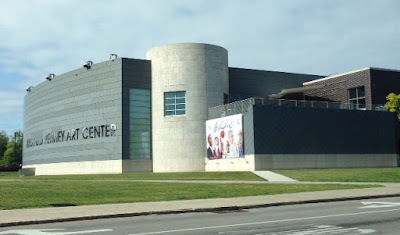 Earlier this month I was at the Burchfield Penney Art Center for my first visit as the Art Center's Artist In Residence. One of my goals with the Residency is to study the working process of Charles Burchfield, an artist I deeply admire, to nourish my own working methods with my paintings. 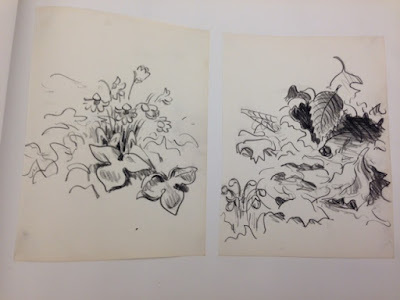 BPAC is a treasure house of Burchfield's drawings. Tullis Johnson, Curator and Manager of BPAC's Burchfield Archives, kindly pulled out for me volumes of Burchfield's drawings to examine. It was amazing to cradle his drawings in my hands (I did wear cotton gloves). Burchfield drew in widely contrasting styles. Most of the drawings I'm reproducing here are his tremendously impressive finished nature studies. Their delicacy and sureness of form made me think of Leonardo da Vinci. Several months ago Scott Propeack, the Associate Director and Chief Curator of the Burchfield Penney Art Center in Buffalo, New York invited me to be the second Artist in Residence at the Art Center for the next year. I'm just returned from the first of what will be a half dozen visits to the museum between now and summer of 2016. In my opinion, Charles Burchfield is one of the best painters of the 20th century. Burchfield has been one of the main influences on my own paintings of the natural world. I'm honored to be given this opportunity by the Burchfield Penney Art Center.